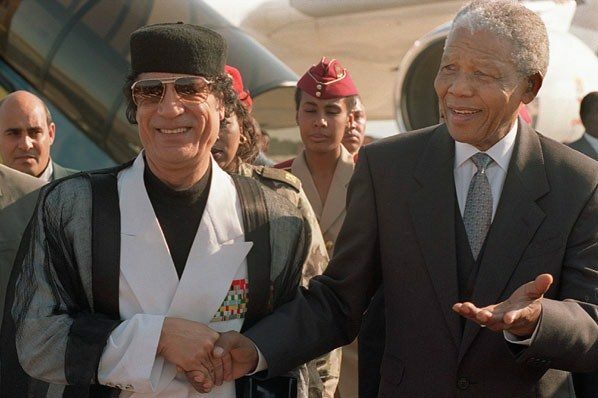 In March 1992 the UN imposed an arms and air embargo on Libya after Qaddafi refused to hand over the two Libyans accused of the Lockerbie bombing, sanctions that were tightened in 1993. But back then Libya had the highest standard of living in Africa that reduced their harsh impact. Libyans were provided with free education, healthcare, housing, electricity, subsidized food and interest-free loans, women wore Western clothes, went to work and attended university. If they wanted to farm, they were given a farmhouse, land, livestock and seeds, free of charge, and their state bank provided loans at 0% interest, as set out in law. And there were no terrorists. More than 60 countries had embassies in Tripoli, along with dozens of multinationals. And in March 1998, while visiting South Africa, President Bill Clinton was told at a news conference: ‘I have also invited Brother Leader Qaddafi to this country. I do so because our moral authority dictates that we should not abandon those who helped us in our darkest hour … and those who berated me for being loyal to our friends can literally go and jump in a pool.’ Clinton is said to have remained smiling throughout the event. Today, Libya is a ‘failed state’, not because of Qaddafi but because of the treachery, greed and deceit of a number of Western countries and their allies in the Gulf. He was targeted for refusing to become a puppet after the 1969 coup, for closing down foreign military bases, and for swiftly nationalizing Libya’s vast oil industry that had largely benefited Western companies. He also hoped to free the entire African continent from Western financial dominance by introducing the ‘gold dinar’, a goldbacked African currency that threatened US dollar hegemony and the West’s central banking system. It probably sealed his fate, although in 2007, former NATO Supreme Military Commander General Wesley Clark admitted that a ‘high ranking’ Pentagon official told him that Washington had been planning for some time ‘to take out seven countries in five years’, with Libya on its hit list. After a decade of US sanctions, Qaddafi paid $1.5 billion to the Lockerbie families and abandoned his missile and nuclear program. Western leaders like Tony Blair and Condoleezza Rice paid him a visit and it was reported that he gave Sarkozy 50 million euros for his election campaign. Qaddafi probably thought that his rehabilitation was complete, but he was wrong. The West was only waiting for the right opportunity. It came in early 2011 when Cameron in Britain, Sarkozy in France and Obama in the US, with his Secretary of State Hillary Clinton ‘leading from behind’, decided that Qaddafi had to go. Secret agencies worked with Islamist groups to foment unrest around Benghazi using NATO for their criminal intervention. When Qaddafi sent his security forces to quell the unrest, it was claimed a civilian massacre was about to happen. It wasn’t, but a UN Security Council resolution forced a no fly zone over Libya without any evidence whatsoever. Germany, Russia, China and India declined to take part. Today, several terrorist groups, including ISIS and al-Qaida, have established a strong presence in the country and Libya is now a haven for human trafficking. Large quantities of weapons from Qaddafi’s arsenal have found their way to Mali, Niger and the Central African Republic, creating instability and mayhem, and Libyan arms and fighters have also found their way into Syria via Turkey. Seven years after Qaddafi’s murder, this once-thriving country is fragmented and in a state of chaos. Despite its vast natural resources, its citizens face hunger, poverty and despair. So far no one has been held responsible for these crimes against humanity. It is highly unlikely they ever will be.